The 2016 Suzuki TU250X revitalizes the retro cruiser style while matching modern design and efficiency. 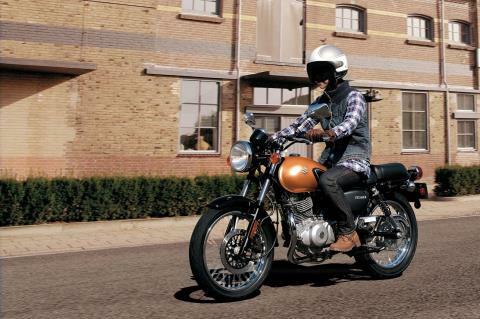 With a fuel-injected single-cylinder engine, sweptback muffler, and chrome spoke wheels, the classic looking TU250X puts the emphasis of riding on fun. For 2016, the TU250X is available in a Metallic Fox Orange / Glass Sparkle Black combination. A variety of Genuine Suzuki Accessories for TU250X owners are available including a large selection of Suzuki logo apparel. Front disc brake with dual-piston caliper and rear drum brakes offer strong braking capabilities. Low 30.3 inch seat height and compact chassis provide confidence-inspiring performance for beginning or smaller riders. Two piece rider and passenger seat further emphasizes the bike’s classic look. 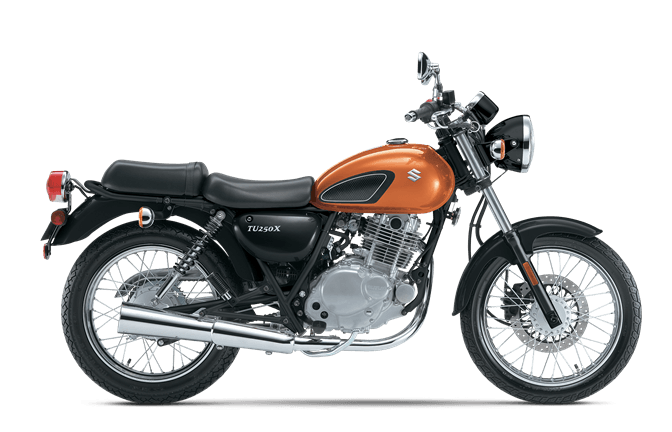 249cc, air-cooled four-stroke, single-cylinder, SOHC engine with Suzuki's industry leading fuel injection system is tuned for strong low-end torque that’s well-suited for city riding. Suzuki Composite Electrochemical Material (SCEM) Plated cylinder for improved durability, light weight reduction and superior heat dissipation. Suzuki Dual Throttle Valve (SDTV) fuel injection system, featuring a 32mm throttle body, provides superb throttle response, smooth power delivery and reduced emissions. Exhaust system has a discreet catalytic converter and an oxygen sensor feedback system that contributes to precise fueling and reduced exhaust emissions. Easy-pull clutch makes gear shifting precise and take offs smooth. Smooth-shifting 5-speed transmission has gear ratios appropriate for a wide variety of riding. Classic single cylinder air-cooled engine styling is matched perfectly to front and rear spoke wheels with chrome-plated rims. Chrome plating also sets off the headlight case, speedometer cover, tail lamp housing and front fork outer tubes. 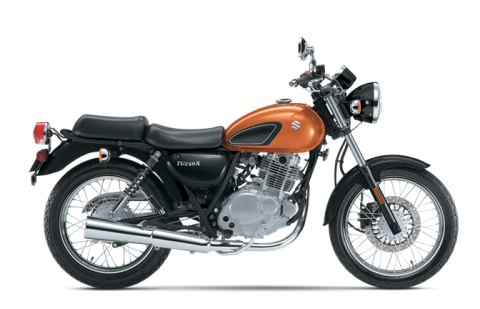 Rich Metallic Fox Orange and Glass Sparkle Black color paint combination complements the bike’s classic appeal. Richly polished crank case side cover produces a beautiful, high quality look.